Recently we announced on our Twitter and on our Facebook feeds that the time and place of the International EISCAT Radar School 2012 has been decided. 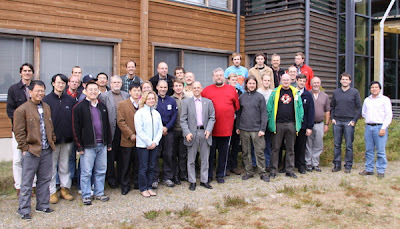 The radar school will take place from 27th August to 1st September, 2012, at the Sodankylä Geophysical Observatory, which is an independent department of the University of Oulu, located in Sodankylä, Finland. The photo above shows the instructors and participants of the International EISCAT Radar School in 2010, which took place at the same location. As you probably know, a radar school was also organised in 2011. It was the first ever joint AMISR and EISCAT Radar School, the International Incoherent Scatter Radar Workshop, and it took place in Kangerlussuaq, Greenland, where our colleagues from SRI International operate the Sondrestrom Incoherent Scatter Radar. The curriculum of both schools has been rather different in that the AMISR school has a strong emphasis on practical group work, while the EISCAT school was designed largely as a series of lectures. We anticipate that the EISCAT school will be revised to include far more practical work than before including hands-on experience in running an EISCAT radar, which will be complemented by a consistent set of lectures. Already now, we invite you to participate in next year's radar school. Registration will be open in early 2012, and we estimate the registration deadline to be at the end of April 2012.